Twitter could replace Google as a place to go to find useful content. New analysis from Hitwise Intelligence shows a remarkable difference in how people use these two services. It seems that around one in three searches on Google are for transactional sites – we are frequently looking to buy something. 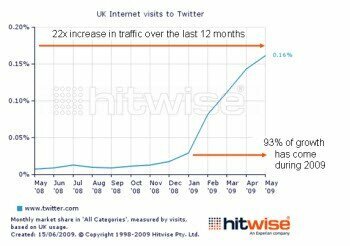 However, over at Twitter, the clicks are all about content and information; less than 10% of the clicks on Twitter go to transactional sites, like shops. It looks like Twitter is beginning to be used as a reference source for useful information, whereas Google is increasingly being used as a means of finding a specific product or a kind of shop. Of course, it is very early days in the development of Twitter. As the graph from Hitwise shows, most of the traffic has arrived only in the past six months. And besides, Google gets millions more clicks, so the actual amount of content-based searches it delivers still dwarfs Twitter. Even so, this new analysis points the way to the fact that people are starting to use different tools for specific purposes. They are tending to get content via Twitter and shopping via Google. It is only the start of such a trend – Google remains important for your business. However, it does show a basic psychological principle at work here. Our brain loves to categorise things; it makes it easy for us to remember and it makes it easy for us to engage with the world around us. Our brain is likely to categorise different kinds of searches – such as searches for products or things we want to buy, searches for material we want to read and searches for people we would like to talk to. True enough, Google can do all those things within fractions of a second. But, if we had separate tools for each category of thinking, we would tend to prefer them as they would fit in more easily with our natural way of behaving. It looks like Twitter is starting to show us that it is a significant provider of content and information, in preference to transactional material. As the growth in Twitter accelerates, this too will become increasingly the pattern and the proportion of clicks to transaction sites at Google will grow. So, what does this mean for your business? It suggests that you should work hard at using Google to rank your transactional pages, such as product sales and concentrate your use of Twitter on helping to distribute links to your informational content.